The Government of Canada recently awarded Toyota funding for research and development initiatives. The company’s projects, based out of its Cambridge and Woodstock plants, will have a long-lasting impact on the domestic automotive sector and will enhance future growth and prosperity. This investment in Toyota will make sure the Canadian automotive industry stays competitive during a time of economic change and is able to support long-term prosperity with global partnerships. Through the Strategic Innovation Fund (SIF), Toyota will receive $110M in automotive grants. The Strategic Innovation Fund offers Canadian industrial and technology-based businesses financial support to fuel company expansion and R&D of products, processes, and services. The Canadian government funding will help retain more than 8,000 jobs, create 450 new jobs, and establish 1,000 new co-op placements within Toyota. As well, a new advanced manufacturing platform will be implemented in the plants to address the growing demand for hybrid cars and innovation. Toyota Motor Manufacturing is the largest automotive manufacturer in Canada, with the plants in Cambridge and Woodstock currently producing more than half a million vehicles every year. Toyota has received $110M in Canadian government funding from the Strategic Innovation Fund (SIF) to develop a new manufacturing platform. The innovation grants from the Strategic Innovation Fund will bring a new advanced manufacturing platform to Toyota’s plants in Ontario. Once completed, Canada will be the North American hub for the Toyota RAV4 model, and home to Toyota’s largest hybrid vehicle production in North America. The vehicles will be more fuel efficient, and tailored improvements in the manufacturing process will reduce volatile organic compound emissions in select shops by 10 per cent; this will further establish Canada as a place for future Toyota cars to be built. In addition, the funding will represent an investment in Canada’s workforce, helping support more than 8,000 jobs in Southwestern Ontario, create 450 new jobs, and generate 1,000 new co-op placements. The Strategic Innovation Fund (SIF) is a Canadian government funding program uniquely targeted at Canada’s industrial and technology sectors to fuel the research and development of innovative products, processes, and services. Eligible businesses may offset a portion of costs related to strategic investments which lead to sustained productivity, economic benefits to Canada, and long-term competitive advantages within the organization. SIF provides Canadian businesses with funding for up to 50% of eligible project expenses. This expands project budgets and enables investment into highly innovative technologies. The Strategic Innovation Fund is currently open to applicants. Automotive firms investing in advanced technologies are encouraged to apply for the program during the planning phase of their project. 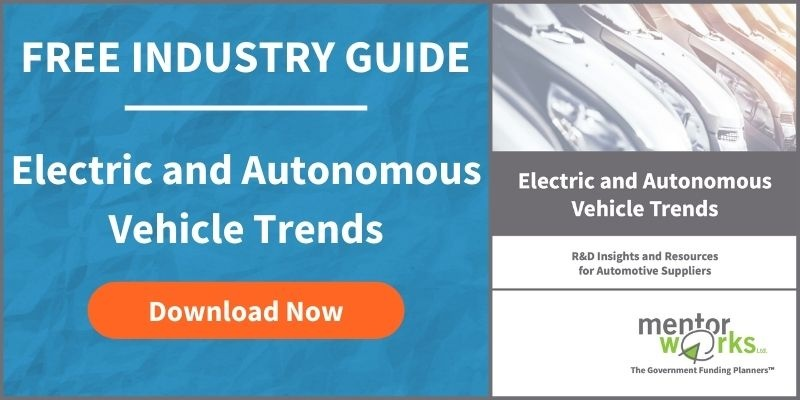 To learn more about the program and discover how to strategically take advantage of automotive grants for technology, download Mentor Works’ Top Trends in the Canadian Automotive Sector white paper. Posted: July 3, 2018 by Myra Bredin. Updated: July 3, 2018 by Myra Bredin.